Sadly, between errands, helping my son with his homework and the heat wave I didn’t make it into the shop yesterday. 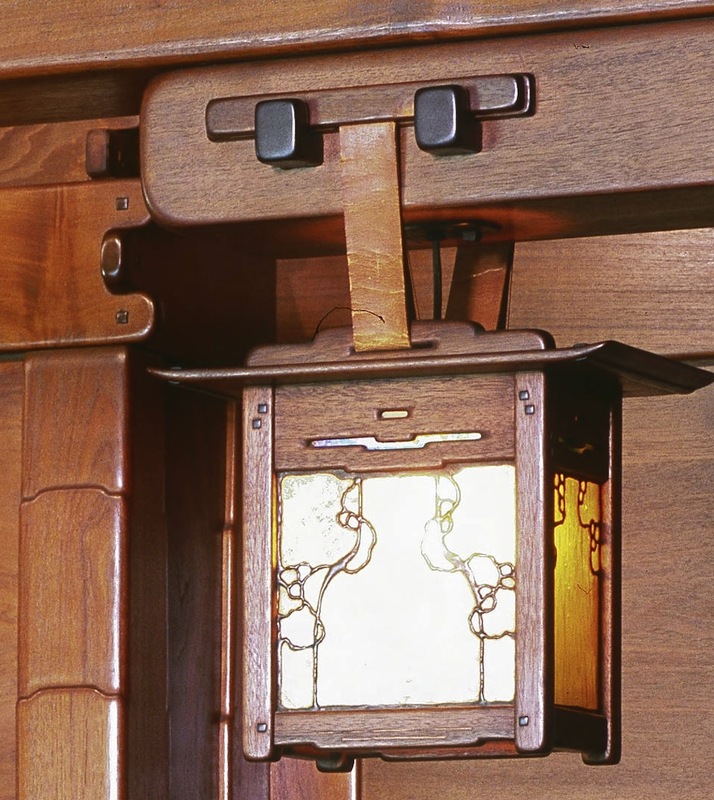 But I did correct a few problems with my design for the Gamble House Inglenook Sconce. And I’m definitely heading out to the shop as soon as the sun comes up, although I think I have one more design change I need to make…see what you think. Here is my updated model compared to the actual sconce. The two main changes I made were to reduce the depth (front to back dimension) by 3/4″, and to flatten out the curve of the roof ends. I also added the rebate for the glass and a radius on the edges. The stiles, which I have at 3/4″ thick are too thick when compared to the original. 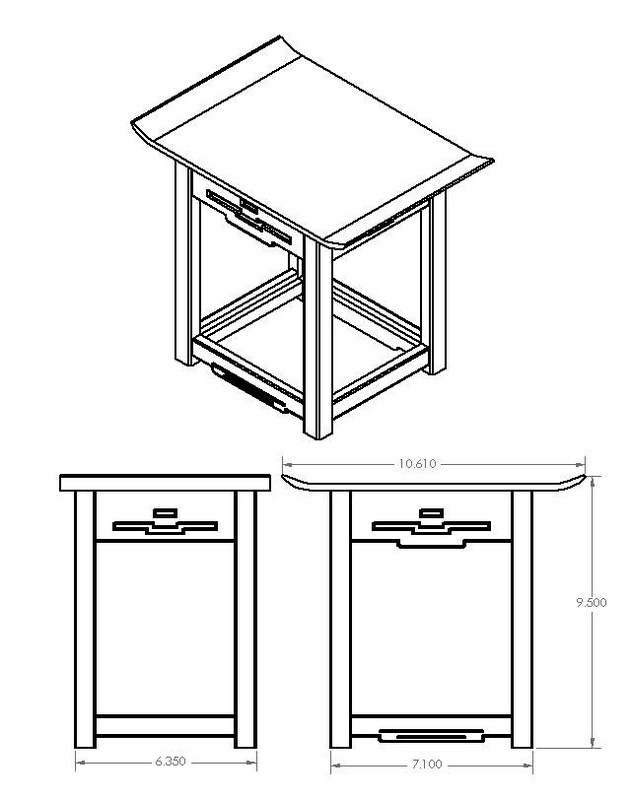 I’m inclined to leave this alone as there just isn’t much material there by time I add the rebate for the glass and cut mortises. I need a 1/4″ rebate to be able to fit the adjacent glass panels in, and I’m using 3/16″ tenons which is about the thinnest I can deal with. I need at least 1/16″ set back for the rails from the face of the stiles for the appearance. Do the math, there just isn’t much room there. The roof, while much better than previously, needs to be thinned out toward the ends. It comes to a sharper edge in the original. I may still have a touch too much curve there too. The cloud life detail in the front rails is too big of a step. It looks like a big tab hanging in space. It’s only .200″, but compared to the original it sticks out like a sore thumb. I’ll need to play with that some more. I’ll try 3/16″ but I’d bet it needs to be a bit less than that. The lower rails on the sides are currently the same height as the short ends of the front lower rails. I think they should be as wide as the wides part of the front lower rail where the cloud lift is. That looks more accurate according to the picture. I need to add the cloud-lift bracket that holds the leather strap, I think that will make the comparison a bit more favorable. The glass rebate is too small at 3/16″. With the two side glass pieces in place that only leaves 1/16″ per side (at most) to hide the edge of the front and back panels. That won’t work. Fixing that screws with the joinery, and I made that mistake in wood on the Blacker sconces. Definitely need to fix that in CAD! I should also get the sconce model into the same viewing angle as the photograph. That would make comparisons easier. 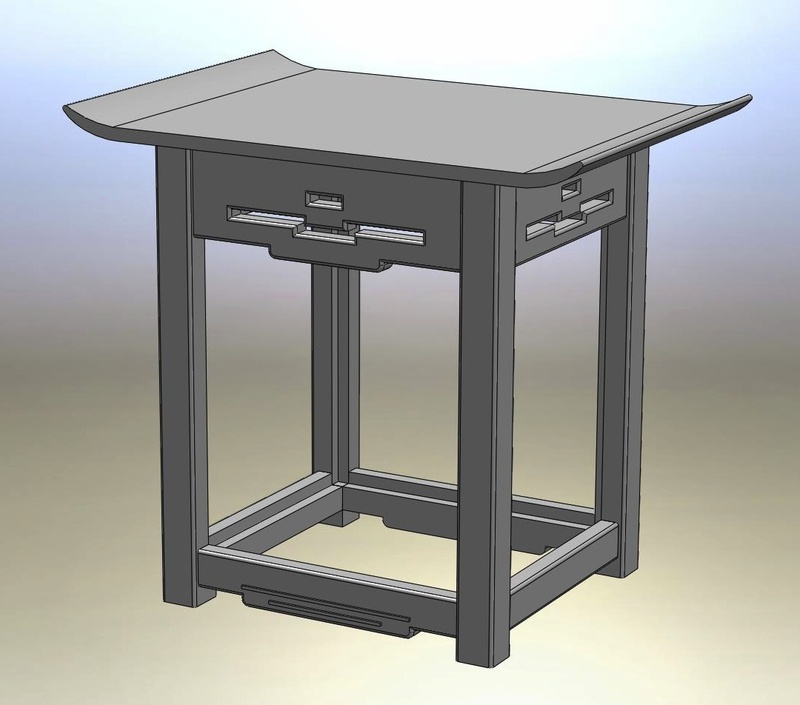 I really don’t want to spend too much time fussing with the CAD model, but I know that if I take a short cut here I won’t be happy with the end result. It doesn’t need to be a perfect copy of the original (indeed, working from one view in a photograph I don’t see how it could be) but I want to make sure any deviations from the original are understood and intentional — and aesthetically pleasing. I’ve also been unsure how I was going to mount the bulb socket inside, and how I’d then attach the top (roof? lid?). I think I have an idea for that now. Here are front and side views of the current model.